Behold the mold … and bacteria that grew from being exposed to a hand dryer for three minutes. If you're a germaphobe, this viral Facebook post might make you a little squeamish. 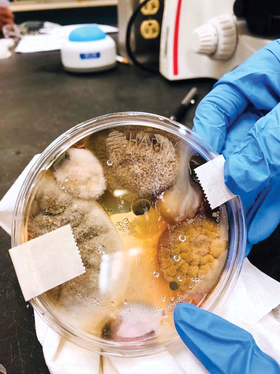 The post, now shared more than 578,000 times, shows a petri dish swarming with colonies of fungi and bacteria collected in an enclosed hand dryer. "This here, is what grew in a petri dish after just a few days. I stuck the open plate in an enclosed hand dryer of a public bathroom for a total of 3 minutes. Yes 3 only," microbiology student Nichole Ward wrote in the post. Ward took the photo for a class assignment that let students pick a location, open a petri dish and see what grew in the next few days. Ward's dish exploded with bacterial growth, far more than what her classmates' samples had. "Mine just had so much more mass in the fungal growth," the aspiring California nursing student told the New York Times. "Their little colonies were just a speck here and a speck there. It just stood out by far." In a statement to ABC News, Dyson, the maker of the hand dryer in question, said it was surprised by the results and "unclear on the methodology employed." So are hand dryers really that gross? A study published in 2016 in the Journal of Applied Microbiology found high-powered jet hand dryers spread more germs than regular warm air dryers or paper towels. A 2010 study found those high-powered hand dryers actually reduced the transfer of bacteria compared to the regular dryers, but it was funded by Dyson. A Mayo Clinic study from 2000 found "no statistically significant differences" between paper towels, cloth towels, hand dryers and air-drying.